In our last blog, we discussed what you need to do to give compliant DB Transfer advice, post October 2018. We looked at TVC, and why it is a great illustration of value for money, but a poor indicator of suitability. We talked about the things your APTA should focus on, such as clients’ specific and personalised objectives, and how your experience with retirees helps establish their realistic income needs. But what your APTA is still missing, and where Cashflow really comes to the fore, is a way of “clearly demonstrating” different outcomes to the client. We can talk about trade-offs, impacts, and risks till we’re blue in the face, but unless we can help clients visualise them, we’re not fulfilling the APTA requirements. It’s NOT mandatory, but it might as well be. One of the questions we regularly get from our customers is “how do people who DON’T do cashflow modelling explain this to clients”? The simple answer is that there really isn’t any way of illustrating the potential risks and rewards of DB transfers, other than by using cashflow modelling software. This is a sentiment which was mirrored by all participants at this week’s Pension Debate. Many advisers are concerned about meeting the minimum suitability requirements for DB transfer advice. If you’re producing a comprehensive cashflow model for a client, incorporating not only how transferring meets your client’s objectives, but also highlighting the traps and pitfalls they may encounter along the way, you’re probably already exceeding them! There’s a misconception that cashflow modelling has to be complicated. This really isn’t the case. To illustrate this, I’m going to build the simplest of cashflow models for Bob, to illustrate how even the most basic of illustrations helps highlight the impact of financial decisions in an easily-understandable, transparent, and straightforward way. The most powerful cashflow is one which balances detail and simplicity – allowing you to give comprehensive advice, while still making sense for your clients. This is Truth’s Cashflow Capital chart. 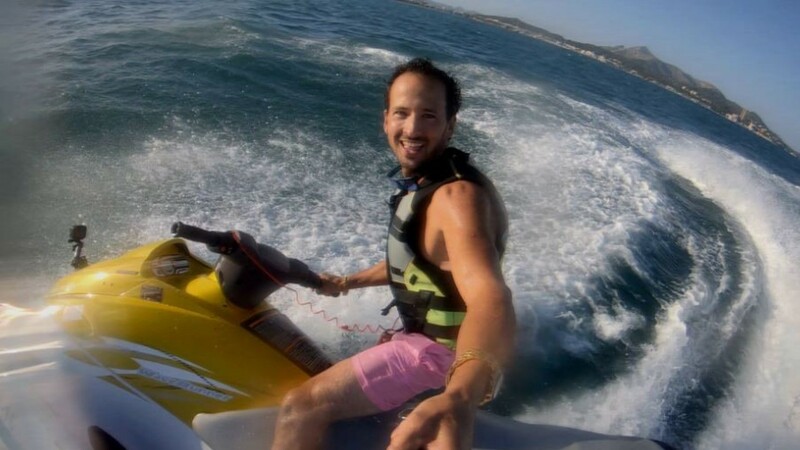 For those of you who are unfamiliar with our software – in a nutshell: it shows the client’s liquid capital position throughout their life, and whether they have enough money to realise their desired future lifestyle. It’s not quite true to say that this is Bob’s cashflow: this is just Bob’s DB pension. I’ve not included anything else in this model – all we have here is Bob’s £30,000 per annum income from age 65. It’s literally the simplest cashflow I’ve ever created! What it does allow us to see, however, is the direct impact of transferring out of his DB pension. This is similar to what we saw earlier in the TVC – a graphical illustration of the value for money the client gets by transferring. What does this show? 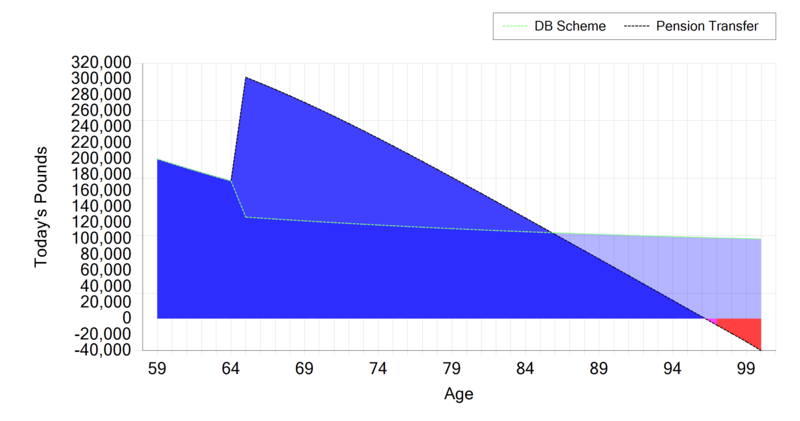 The orange line is Bob staying in his DB pension. The black line is Bob transferring. Here he’s taking 25% of his pot as a tax free lump sum at 65; Truth has automatically calculated a sustainable income from his drawdown fund, and overlaid this on the cashflow. 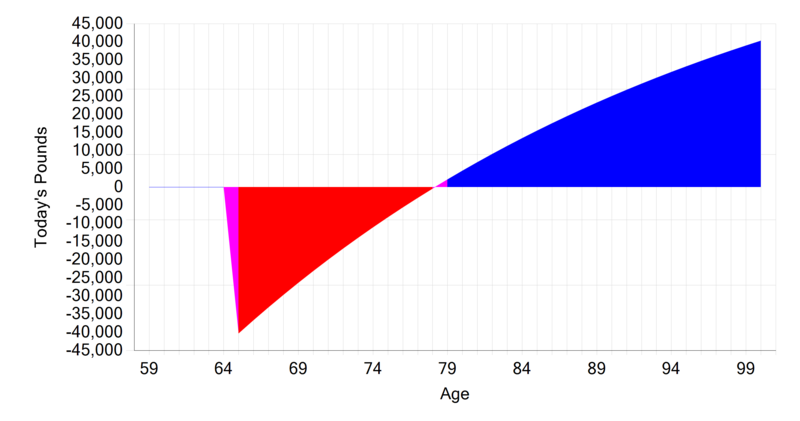 According to this, transferring would leave Bob significantly better off initially, and marginally worse off if he were to survive beyond his mid 80s (but still not running out of money). By looking at the pension in isolation, it’s incredibly easy to see a direct comparison between the two options, and the impact of transferring. In very direct terms, is Bob better or worse off by transferring? Looking at Bob’s cashflow, rather than his TVC, we can already see that the answer is less black and white. 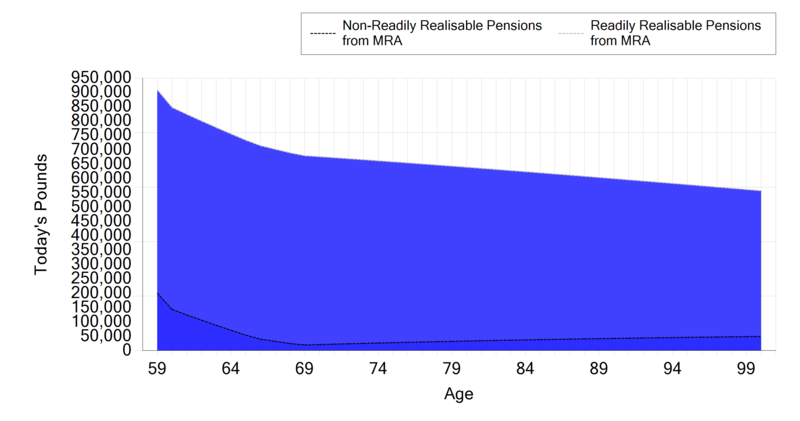 But clearly it’s nonsense to look at Bob’s pension in isolation. 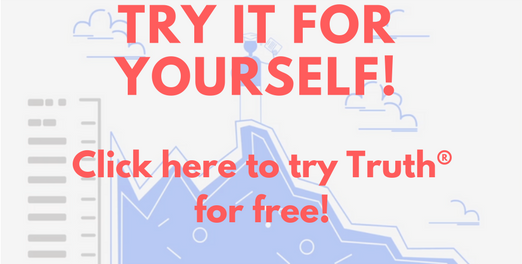 As we established in our last blog, APTA isn’t about value for money, it’s about suitability. We’re not just interested in whether Bob is “better” or “worse off”, we want to see if transferring out is better suited to his objectives than remaining in his DB pension scheme. It’s essential that any APTA cashflow takes into account Bob’s income need and objectives – it’s simply not good enough to look at the pension in isolation. Bob said he wants £20,000 per annum in retirement – how does his cashflow look taking this into account? Here you can see the Basic Cashflow (black line) at the top, assuming no expenditure, and the cashflow taking into account Bob’s Income Need (orange) down here at the bottom. You can immediately see the importance of factoring in Bob’s expenditure. We’re building up the cashflow, layer-by-layer. Unsurprisingly, as we know he’s getting £30,000 income from his DB pension, and only spending £20,000, we see that Bob still doesn’t have a problem. Remember this is Bob’s liquid capital position. Clearly his DB pension alone doesn’t allow him to pay off his mortgage – there isn’t enough liquid capital to allow it. This further reinforces the point that, while it’s important to keep the model simple, there’s a minimum level of detail we need to build into the model. 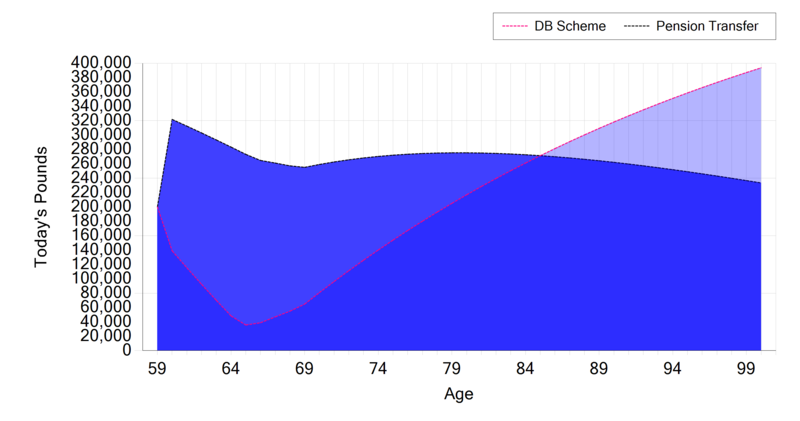 The light blue line shows Bob staying in his DB pension scheme. He pays off his mortgage from his savings, and has more than enough money for the rest of his life. The black line shows Bob transferring. 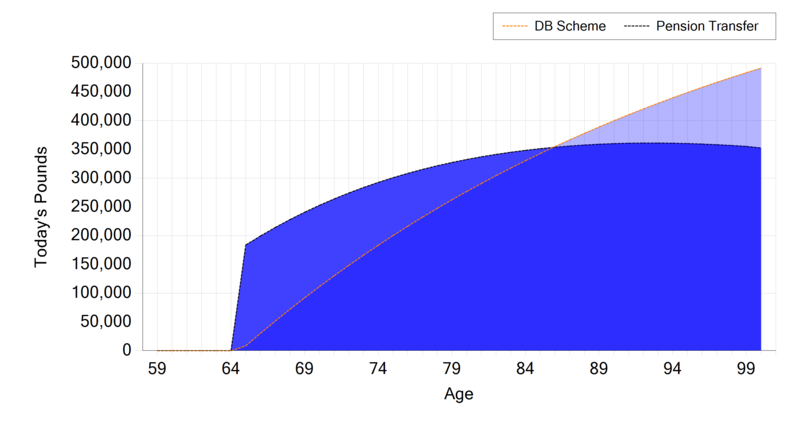 He pays off his mortgage from his PCLS, but might run out of liquid capital at 96, and would be better off remaining in his DB scheme if he lived beyond age 85. Because we’re keeping all the other variables the same, we can clearly see the impact of transferring, and whether it might be suitable in Bob’s specific case. There’s two really interesting things going on here. Firstly – we’re starting to see the value of building a more comprehensive cashflow (albeit we’re still only looking at a handful of elements); secondly – we’re starting to see a dramatically different cashflow if Bob transfers. What we can see here is, as required by APTA, the impacts and trade-offs of transferring. As we build the detail and the complexity of the model, the pros and cons of the different courses of action start to emerge. With this extra income taken into account, but with 5 more years’ living on his transferred pot, would you expect Bob to be better or worse off, if he were to transfer? This is an interesting chart, and it’s really where we start to see the impact and trade-offs of transferring that APTA refers to. We’re finally at the stage where we have a “complete” cashflow, and are still only changing one variable in our comparison. The orange line is Bob staying in his DB scheme; the black line is Bob transferring. What we can see here is that Bob would be financially secure in either case, but “better off” from around age 85 by staying in his DB pension scheme. If he stays in his DB pension scheme, he ends up with far more capital than he needs in later life. This is what I’d refer to as a “Full” cashflow for Bob. The pink line is Bob transferring and (rather than taking his tax-free cash up front) taking a small income from his transferred pot. The light blue line is Bob staying in his DB scheme. The model is still REALLY simple – it’s really just 5 elements: his transferred pension, state pension, his savings, his mortgage, and his income need, but it allows us to cover all of the APTA requirements. We’re looking at all of Bob’s objectives, and taking into account his realistic retirement income need. We know that £5,000 is enough, but what I’ve done in this scenario is I’ve assumed that Bob will draw £8,000 per annum from his transferred pension, just in case he’s understated his retirement income need. This is supplemented by his savings and his state pension, and we can see that his cashflow looks pretty good. Remember there’s only 5 elements to Bob’s cashflow, and 4 of them are the same in both of these scenarios. What this means is that we can show our client the direct impact of transferring and not transferring, while meeting all of their objectives, and satisfying their income needs. This is where we can really start to add value for Bob, and show him those all-important impacts and trade-offs. Remember the cashflow only shows Bob’s liquid capital… here’s Bob’s cashflow if he were to transfer, take £8,000 per annum income from his pot, but incorporating the value of his pension fund. We can see from this that, if Bob were to transfer, he’d potentially still have nearly £600,000 in his pension fund at age 100. This helps us look at Bob’s final objective: putting money aside for his children and grandchildren. What’s interesting about this case is that, from a cashflow perspective, Bob is “better off” staying where he is. This confirms what we saw on the TVC, which showed that Bob was about £150,000 worse off transferring than staying in his DB pension. But remember the TVC is comparing one thing the client doesn’t want to do with another thing he also doesn’t want to do! When we look at the wider picture, not only in terms of the client’s cashflow, but also how transferring might help them meet their goals and objectives, we can help Bob look at whether he would like to go ahead with the transfer, armed with all of the information we need to give him to satisfy the APTA requirements. We’re providing Bob with a bespoke (i.e. 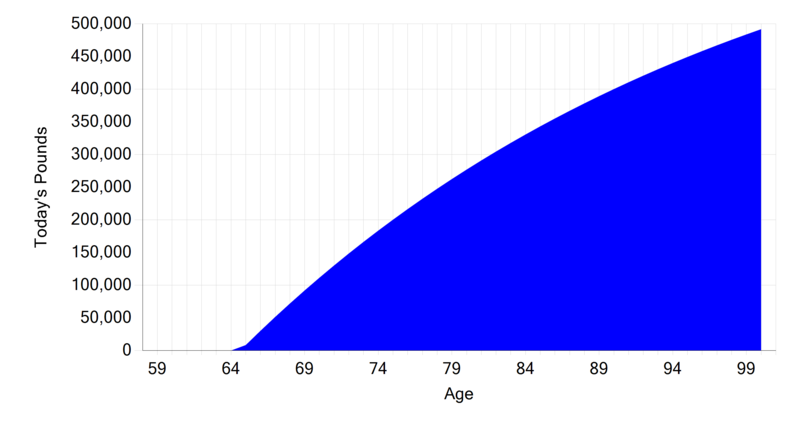 “appropriate”) pension transfer analysis, which clearly demonstrates the impact of transferring. Unlike the TVC, which could equally apply to anyone in similar circumstances, this is most definitely Bob’s cashflow. We’ve covered his objectives, and whether they’re better served by transferring or not. 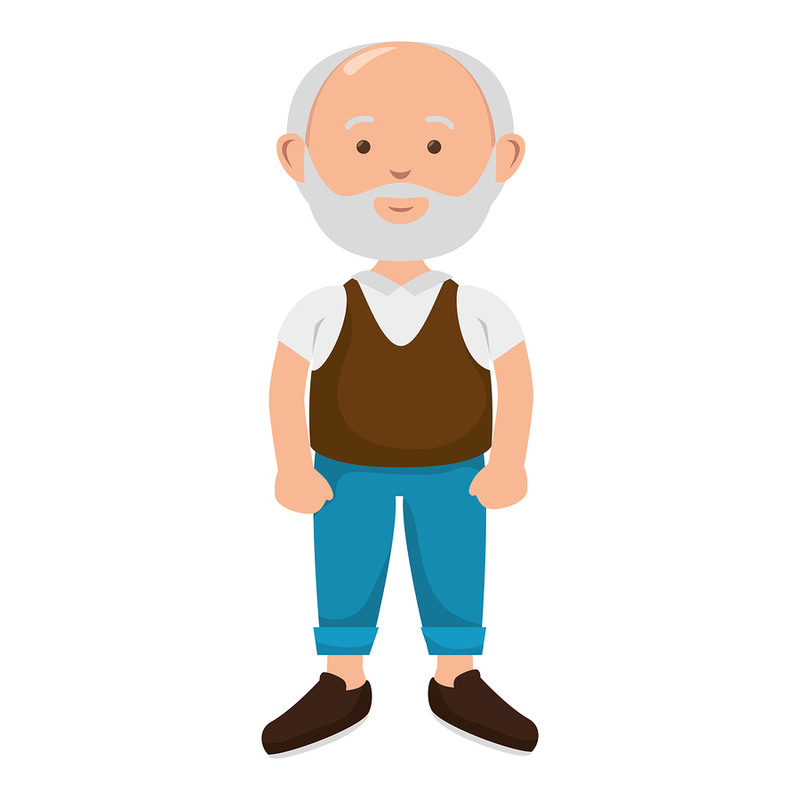 We’ve explained to him the difference between safeguarded income from age 65 and flexible income from age 60. 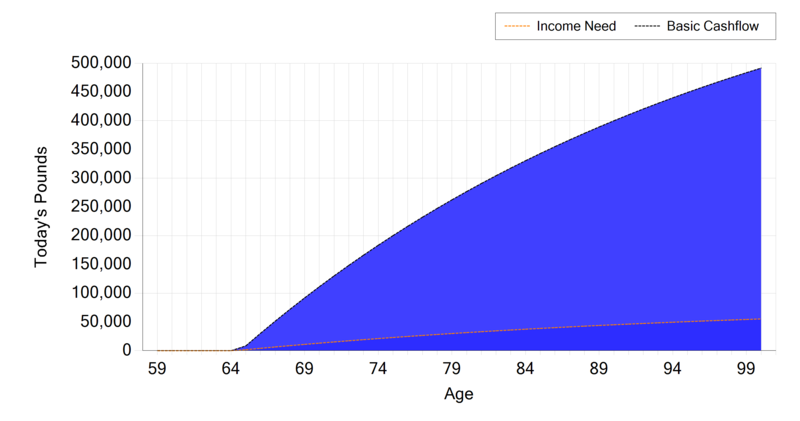 We’ve discussed his Income needs, and the impact and trade-offs that come about as a result. We’ve shown him that there is an alternative – i.e. paying off his mortgage with savings. We can even test his capacity for investment loss. Cashflow modelling software, used well, can help you satisfy, and even perhaps exceed, the requirements of APTA. It takes into account clients’ aspirations and allows them to see whether transferring better meets their needs, rather than just whether transferring leaves them “better off”. 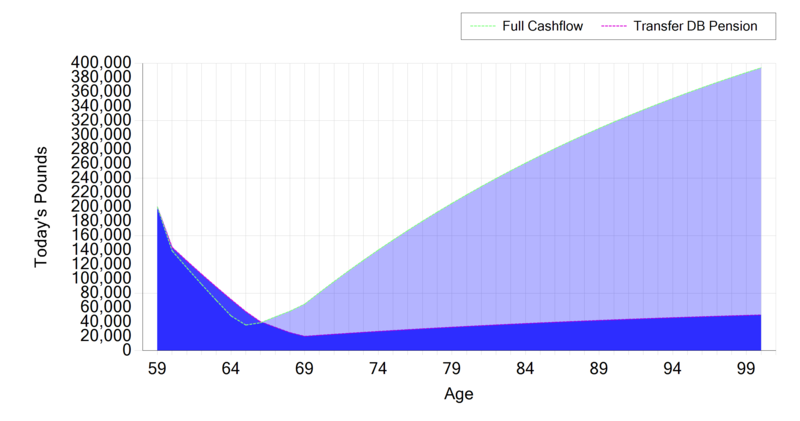 The value of Cashflow modelling is that it helps facilitate the decision making process by illustrating to the client not just the difference between staying in their DB pension and drawing an identical income from a drawdown fund/SIPP, but more importantly the difference between staying in the DB pension and doing what they actually want to do with the rest of their lives.